Here are the chicks, one week older. They're developing little tails now and the feathers on their wings are quite well grown. We had to rehouse them in a bigger box, as last night they knocked over the water container and flooded the base of the old one. The water container is now on an upturned plate, which makes it more stable and also prevents them kicking wood shavings (and even less savoury items) into it. We've elevated the feed container as well. Being somewhat dim, the chicks would kick shavings over the food and then not realise there was any food there. The feeder is now sitting on two old egg boxes and is relatively free of shavings. I'm hoping the egg boxes will give them inspiration for their future role! They look so healthy! 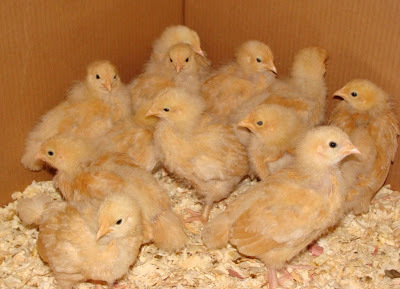 I am about to rehouse my meat chicks too. They are quickly outgrowing their brooder. Boy do those things grow fast!